Metal maniacs, rejoice! 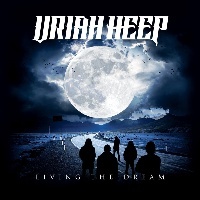 I am proud to present to you: URIAH HEEP; signed via Frontiers Music Srl Records, hailing from England - performing Rock, on their 25th album entitled: “Living The Dream” (released 14th of September, 2018). Since formation in 1969; the band in question have 24 studio albums in their discography so far, I am introduced to their 25th album entitled: “Living The Dream”. 12 tracks ranging at around 59:53; URIAH HEEP arrange an intricately designed formula of heavy-hitting Hard Rock developments, the incredibly catchy “Grazed By Heaven” begins the album - demonstrating distinctively boistrous bounciness while amalgamated with a bunch of melodic harmomies and psychadelic ultilizations. The titular track conveys captivating contrast; constructing in concretely inventive craftsmanship, distributing diligent composing adroitness while attributing with vehement thunder and progressively technical results – amplified with adrenaline and fluidly polished persistency. Consisting of Bernie Shaw on vocals; the frontman establishes diverse songwriting variety, energized with flamboyant pipes and profusely robust proficiency. “Take My Soul Away” captures enlightening and exciting designs of meticulous ramifications; embellished on dynamic complexity from dextrous guitarist Mick Box, consistently delivering blisteringly orchestrated rhythms of relentlessly riveting skill. “Knocking At My Door” executes hardened hymns of harmonic elements; distinguished with creatively crafted implementations from fuzzy keyboardist Phil Lanzon, portraying a grandiose representation of profusely robust prodegiousness. “Rocks In The Road” delights with more enlightening and elegant fulfillments, as the grandure generates memorable originality. “Water’s Flowin’ is an enjoyably exquisite anthem; as audible bassist Dave Rimmer showcases salubrious contributions, channelled with detailed stability - while the equally exquisite drummer Russell Gilbrook batters his steel with adequately coherent pummelling. “It’s All Been Said” is another exhibition of subtly rewarding solidity, jam packed with radio-friendly juxtapositions while barraged with jumpy heaviness. “Goodbye To Innocence” hammers with more entertainment, flaring with rambunctious onslaughts that converge combustious injections of organic substance and memorably original concepts - grooving with ambitiously fun finesse and old-school, razor-sharp nimbleness. “Falling Under Your Spell” advances with similar characteristics, differentiated with unique adaptations. “Dreams Of Yesteryear” overall concludes the record; still displaying bluesy-esquire culmimations with calming, light-hearted hard rock sufficiencies. Additional tracks include 2 alternative versions of the magnificent “Grazed By Heaven”; which after a 2nd time listening to this one, had me hooked even more and grabbed me to believe that this is easily my favourite track, and the other edition of the even more pleasureable “Take My Soul Away”… I can finalize that URIAH HEEP certainly outdone themselves and exceeded all expectations I originally once had. For a band who have 25 records in their legacy so far, they are making me want to discover their older classics as I want to be educated on more intriguing Rock ‘n’ Roll after this! Excelling stuff.